Now available from my Etsy Store! 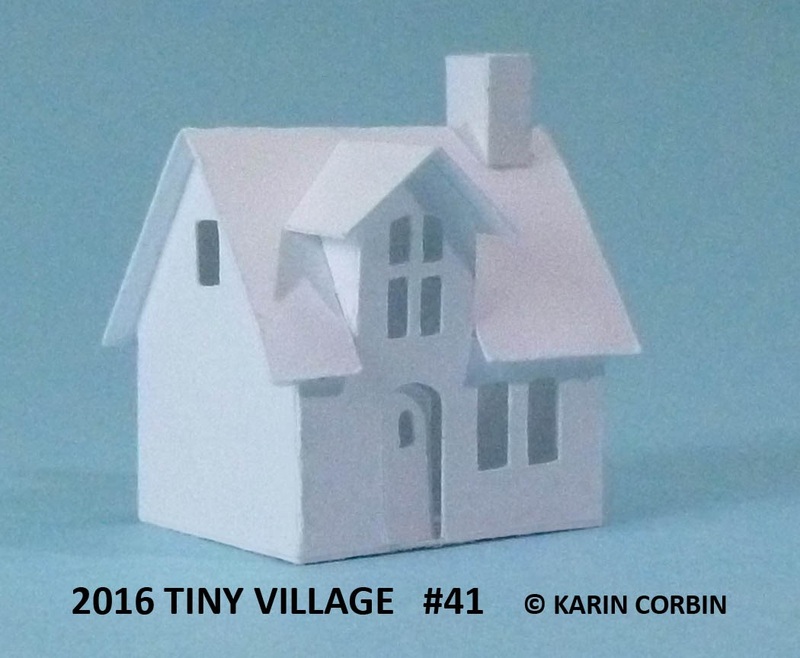 Tiny Village 2016 is a set of 8 miniature paper buildings. There are three color choices, white, black and gingerbread brown. There is also a smaller micro size version of this kit which also uses these assembly directions. The photos used in the instructions were taken using the lager Tiny size which is approximately 1:220 scale. These are to be considered as decorative paper buildings, they are not accurate scale models of any pre-existing buildings. I am the designer as well as the person who cuts and packages them for you. The buildings in the set "Tiny Village 2016" begin with number 40 and end with number 47. 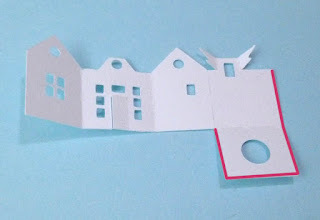 Before you begin to assemble this set please refer to the posting located elsewhere on this blog http://glitterhouses.blogspot.com/2014/03/tips-for-folding-tiny-pieces.html for extra advice on making and handling the folds on some of the very small pieces. Now and again you may find you will need to use a sharp knife to remove a chad from a window opening. But don't remove the hinged doors as they are meant to stay attached. 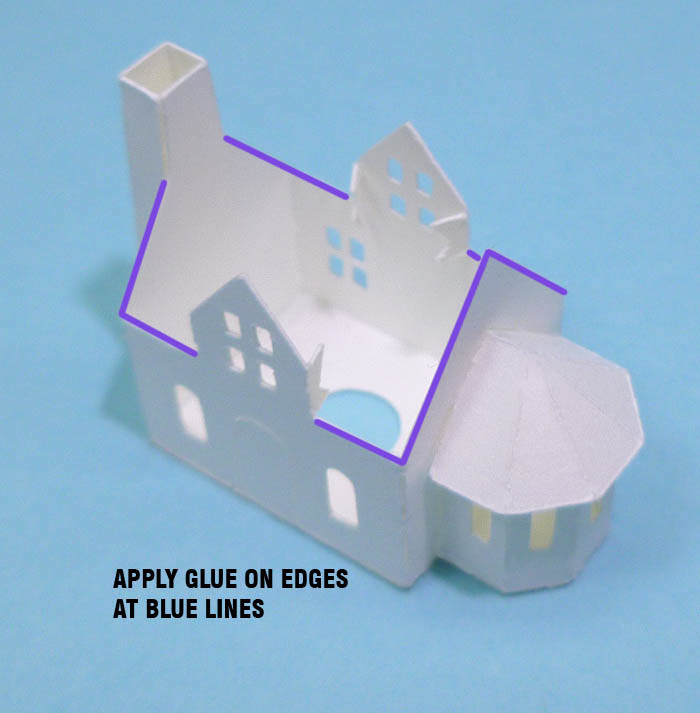 Before you begin assembling a building glance all the way through the instructions so you familiarize yourself with what happens to all the pieces. 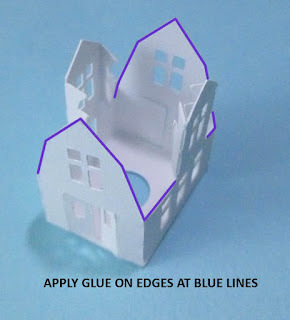 If you wish to decorate a building with gel pens or felt tip markers it is easier while the pieces are flat. 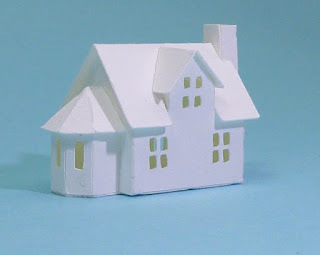 If you wish to paint only do so after the glue is completely dry and then the first coat of acrylic paint must be very thin so that it will seal the paper without making it soggy. Do not ever apply heavy coats of paint. Glitter should be applied after assembly as excess glitter will interfere with the precision fit of the pieces. 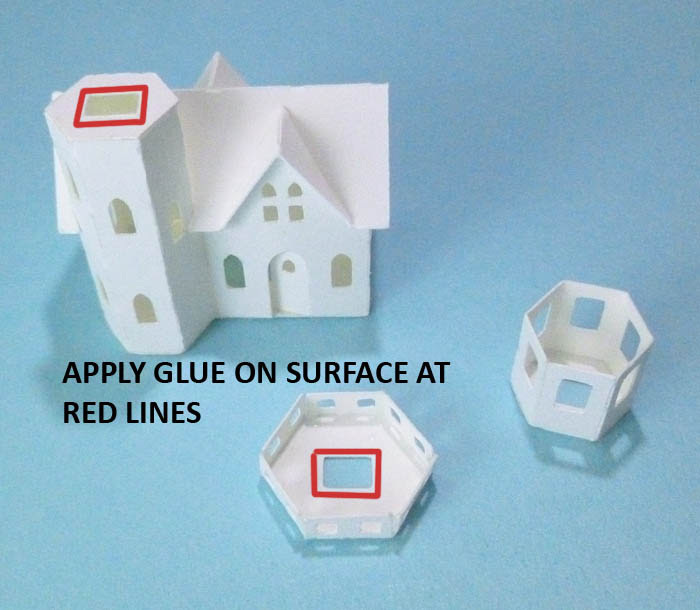 If you wish to have "glass" in the windows you can apply transparent vellum paper to the inside of the walls at the window openings before assembly. Tools needed are as follows. 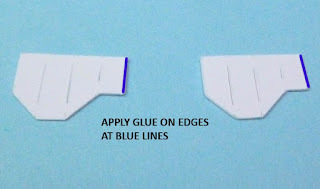 A sharp pointed craft knife, a #11 blade is good, I use the knife for removing any hanging chads from windows and for helping to remove excess glue before it dries. It is also good for gently pushing the walls into position. 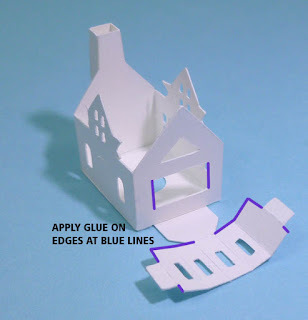 You can use a toothpick or fine point glue applicator bottle for adding just the right amount of glue. 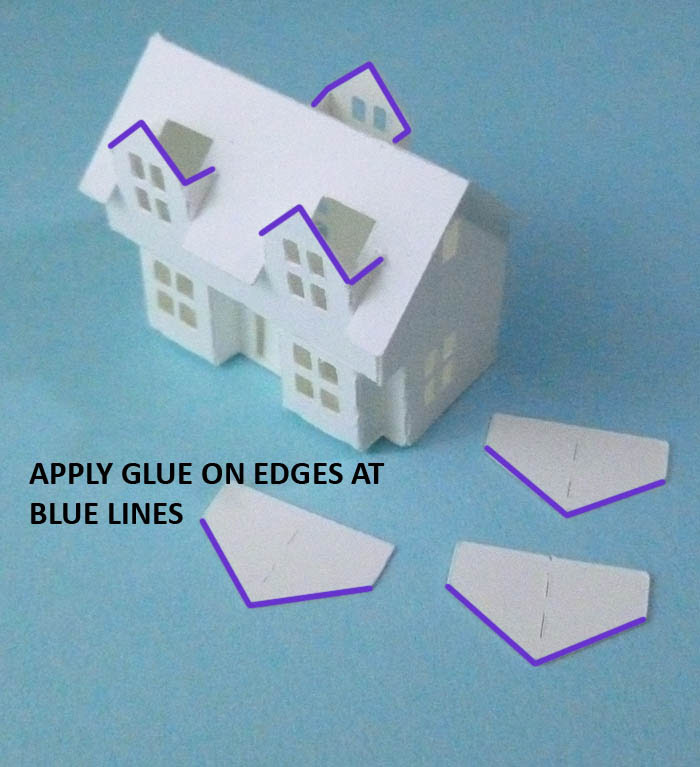 Toothpicks can also reach into deep spaces to help you adjust the edges of pieces during the glue steps. Bamboo skewers are also a great tool for reaching inside of the buildings to encourage the walls into proper position. 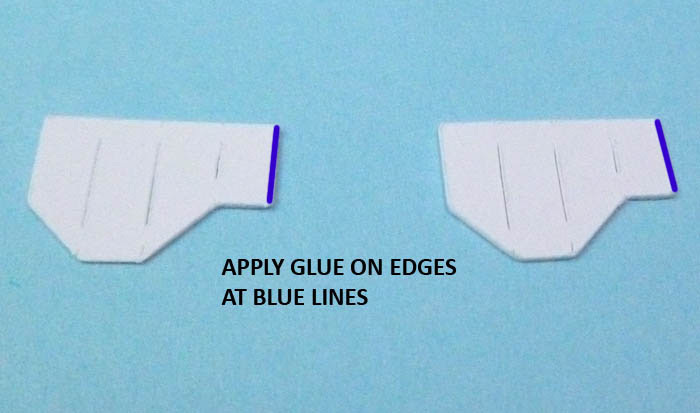 Tweezers with slanted, straight across tips, often called eyebrow tweezers, will help you hold onto the very small parts and help with making bends on them. Your finger are the only clamps you will need. 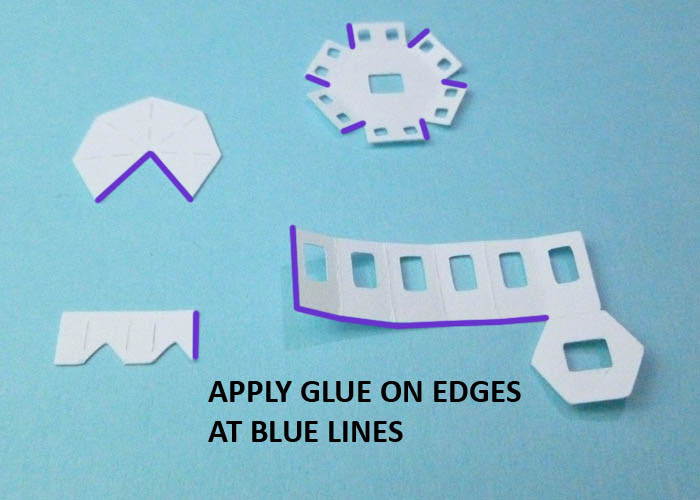 Just use them to gently press the parts together until the glue grabs. When gluing paper a small amount of glue is best as you don't want the parts to get soggy. 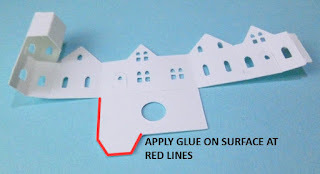 Clear drying, thick, PVA glues work well but choose one that dries water resistant if you wish to decorate the building with paint or glitter. My favorite glue is Crafters Pick "The Ultimate". 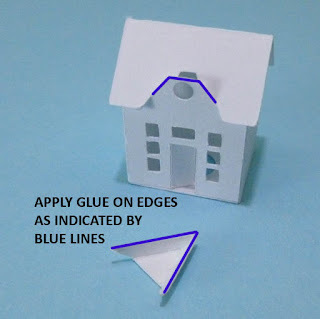 See the sidebar of this blog for sources on materials such as glue, glitter and tools such as the fine point glue applicator bottle with a .7mm metal tip. I love these applicator bottles, they make the assembly go super fast! A .7mm stainless steel sewing pin makes a great stopper for the metal tip. It is important to only use stainless steel pins as regular pins will rust. 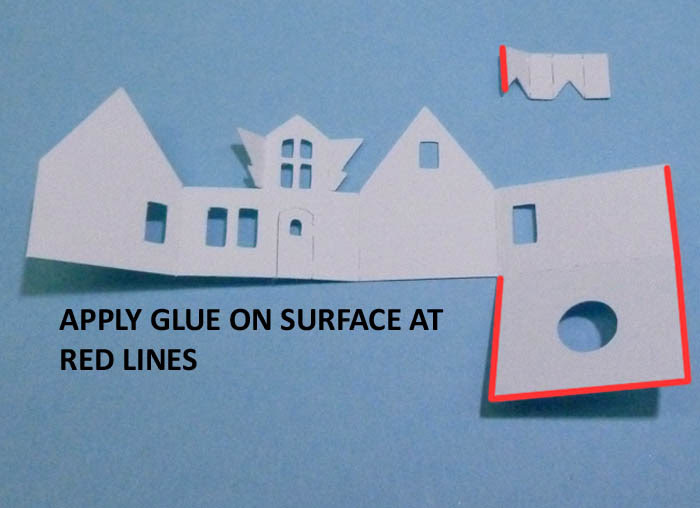 On every building you should always pre-fold the pieces on the bend lines before you start. 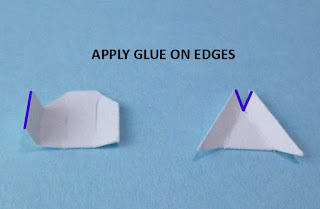 I fold each section completely back flat Against the adjacent section. 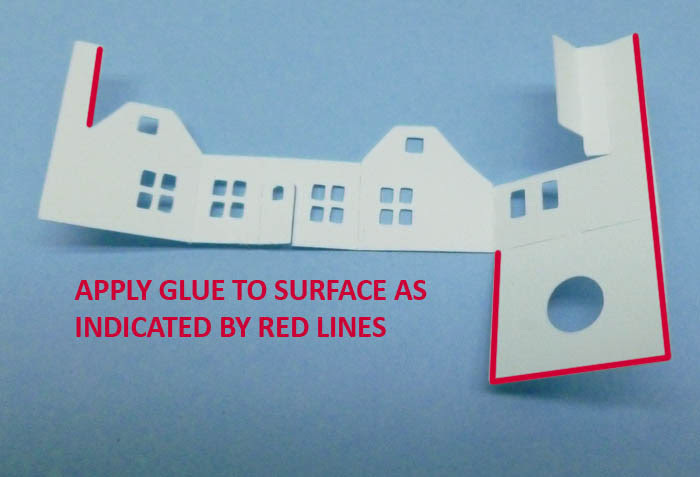 This fully bent folding method will slightly weaken the paper and make it much easier to get the wall sections into the perfect alignment. 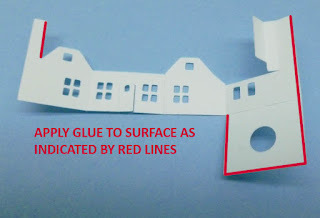 Be sure to always protect fragile areas that have a lot of cutout detail with the flat tipped tweezers for pliers when you fold them., see the link how to fold tiny pieces. 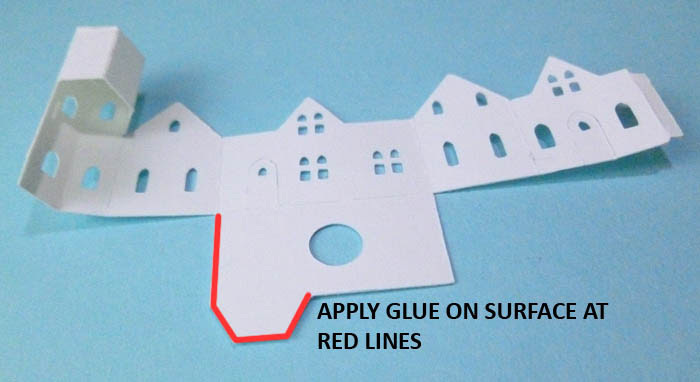 It is often important to test out what you are doing to be doing by dry fitting pieces together before you apply glue to them. More than any other tip I can give to you this dry fit testing before you apply any glue will give you confidence and also lead you to success. You can of course work on more than one building at a time. I often have two or three buildings in progress to allow for glue drying time on parts. Just don't mix up the pats for different buildings as each part is unique in shape and can only be used on its own building. I also recommend placing parts that are not in use towards the back of your work surface. Remember....tiny parts can easily get swept off a table by sleeves and hands. After you have assembled a section and the initial glue has dried you can reinforce the inside edge of the join, where it can't be seen by adding a fillet line of glue. An example of that is shown in this photo. I rarely use tabs on these buildings. The scale of the buildings is such that a tab can significantly throw off accuracy of corners of buildings meeting flush together. However there are some tabs now and again that are used for alignment such as keeping a tower wall in vertical alignment up its full length. Or sometimes they provide a backup light gap hiding cover at an intersection of walls. 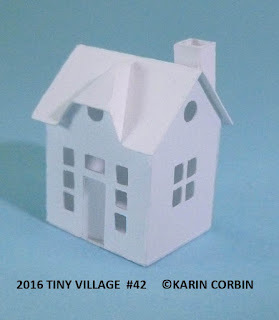 Now lets begin putting your Tiny Village 2016 buildings together! 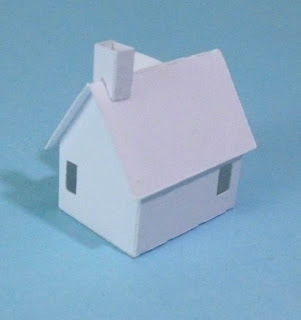 The first building is easy, only two pieces to assemble. 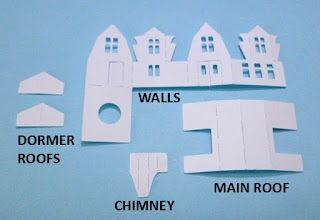 The chimney is created as you fold around the walls. Take the time too look at all the photos in the instruction before you start. If you are confused just look at the next photo in sequence to see how a step looks when completed. You can also refer back to the first photo shown in the instructions. 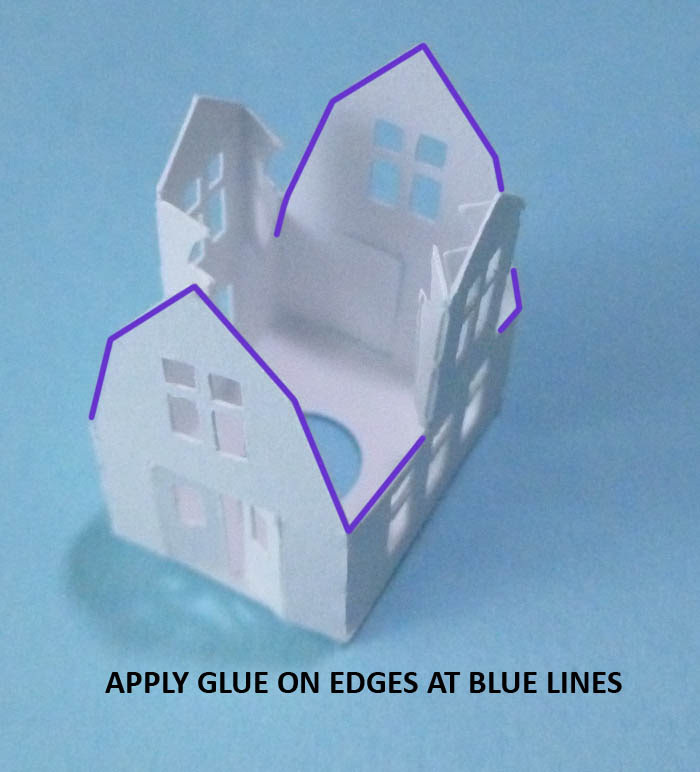 As part of the instructions on the first few buildings I will add a few tips. Tip: The bottom edges of the vertical walls in all of the buildings in the kit will always rest on top of the built in base that has a small round hole in it. 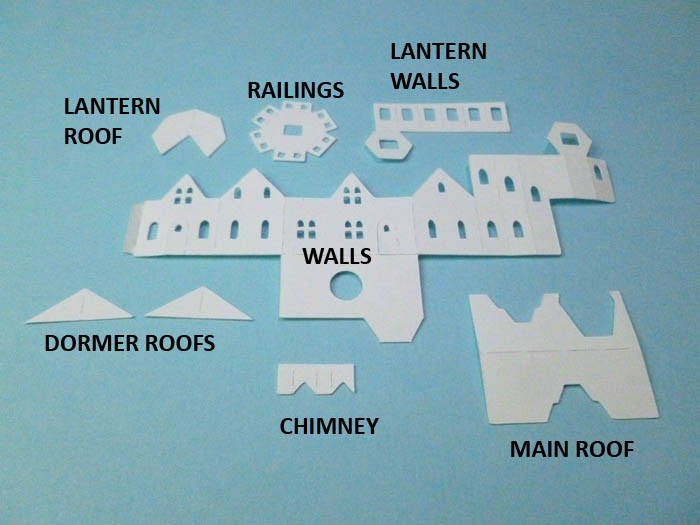 Your packet for the #40 building should contain the parts shown in this photo. For all of the buildings in your kit if a part should be missing contact me through the Etsy Store using your item purchase information and let me know which building number and what part was missing. I do apologize in advance if this should happen to you but of course I will make it right for you as soon as possible! Tip: It is best to open the packets carefully into a bowl or other small container as some of the parts are indeed very small and can get quickly lost on a carpeted floor. Red lines in the photos always indicate where glue is applied to the surface of cardstock. 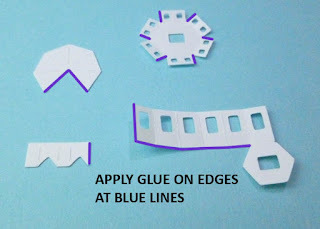 Blue lines in the photos indicate that the glue is to be applied along the cut edge of the pieces. 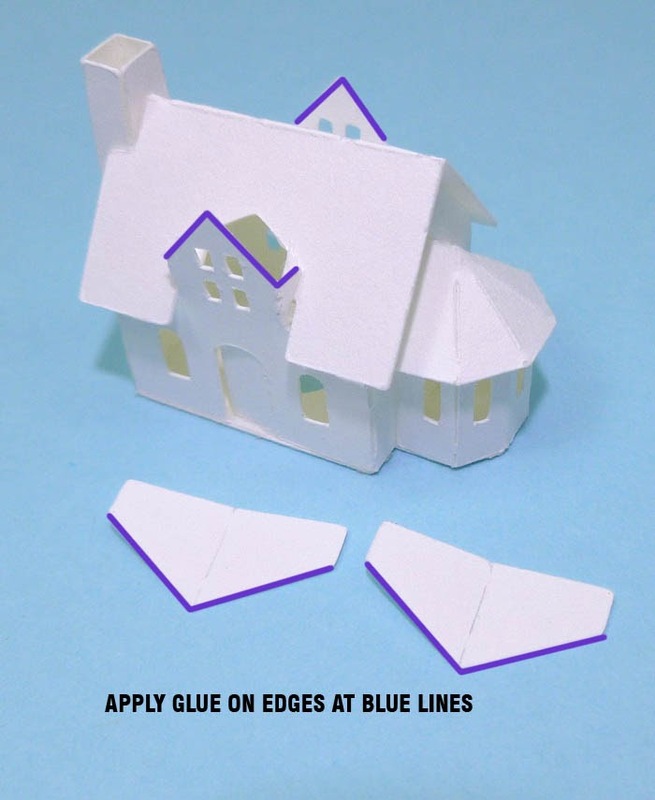 Fold the walls into place and hold gently until the glue grips then set aside to dry before installing the roof in the next step. After applying glue on the upper edges of the building place the roof onto the building. Tip: When installing all the roofs in the village you should always turn the building upside down and also look at the building from the sides to be sure it is located just right. 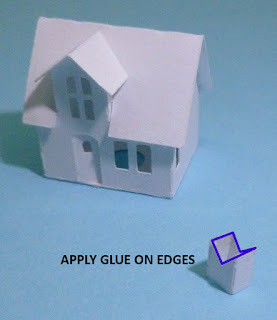 If the tips of the gable are not straight you can reach up inside the hole in the base of the building with a toothpick or wood skewer and gently push on them before the glue has dried. #41 is a small cottage. This time there is a dormer on the upper story. Be sure you read the instructions on folding in the dormer sides before you put the main roof into position. 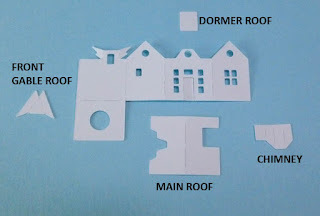 The folding in of the sides before you put on the main roof needs to be done for all the buildings in the kit that have dormers on them. 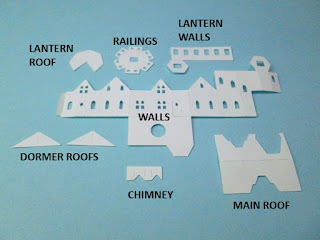 If you look closely at the photos of the walls you will see the dormer sides have a notch in them and that the main roof opening I have created to let light up to the dormer window has a step in the shape. 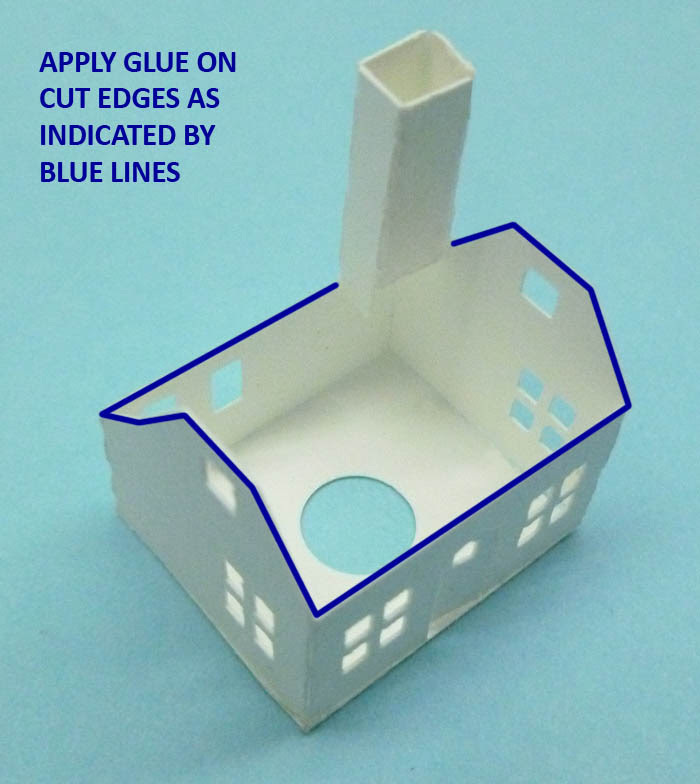 That construction detail is created so that the tips of the dormer sides will rest on top of the roof so that the face of the dormer is then held upright by the roof. Your packet for #41 should contain the pieces shown in this photo. First assemble the chimney and set it aside to dry. That way the glue can dry while you work on the walls of the building. 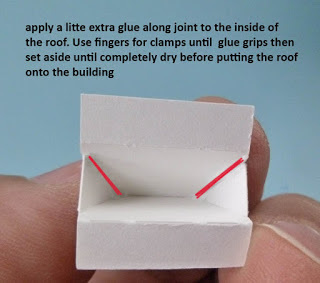 For this first time try a dry fit of the roof before you apply any glue. That will be useful in understanding the moves you need to make to get the roof on. 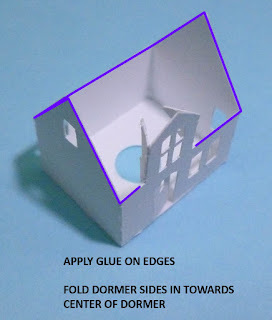 Note in the photo that the sides of the dormer need to be folded in towards the middle of the dormer before you try to put the roof onto the building. 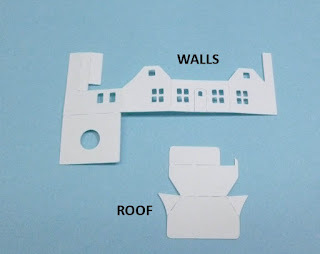 You will fold them back out into position and can then secure them in place with a small amount of glue on the inside of the wall to roof location. 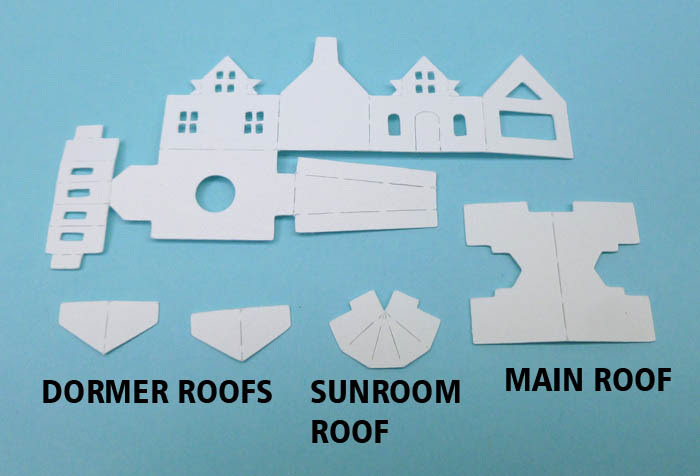 When installing the roof you might need to gently flex outwards on the dormer wall to get the dormer sides to clear the top of the roof. 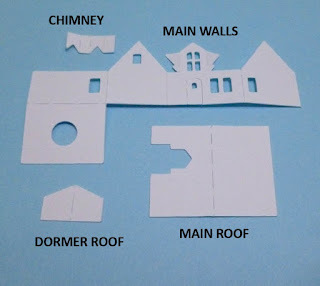 This will be typical for any buildings that have dormers. Tip: This method of folding in the dormers before putting the roof on is required on all the buildings in the kit that have dormers. Tip: when putting glue onto the cut edge of the dormer roof section I fold the two halves together and run the glue line over both edges at once. 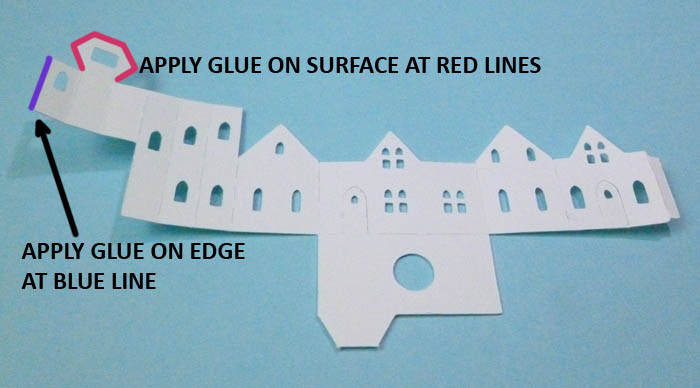 It is faster and a less messy to get a small amount of glue applied to those edges than trying to do one long run of glue. 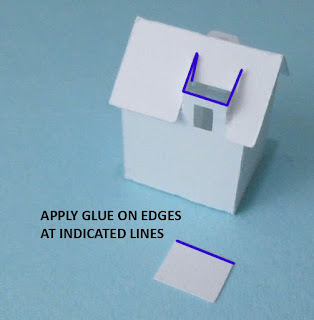 Tip: hold onto the front edge of the dormer roof with tweezers during installation. 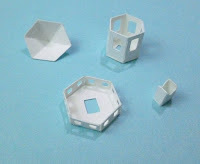 It makes positioning these small pieces much easier than trying to hold them in your fingers. 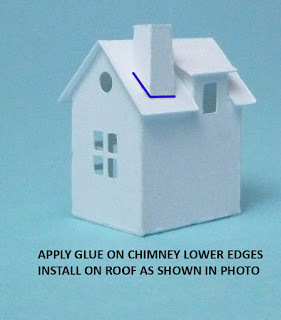 Apply glue to lower edges of chimney and install in the position shown in the next photo. 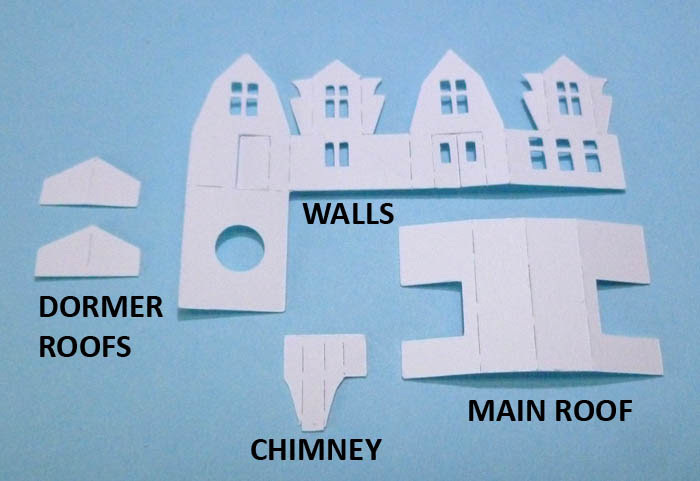 Note that the wall of the chimney will be in line with the wall of the building when looking at the building from the back or the front. Here is how the chimney looks from the back. Congratulations you have finished building #41! 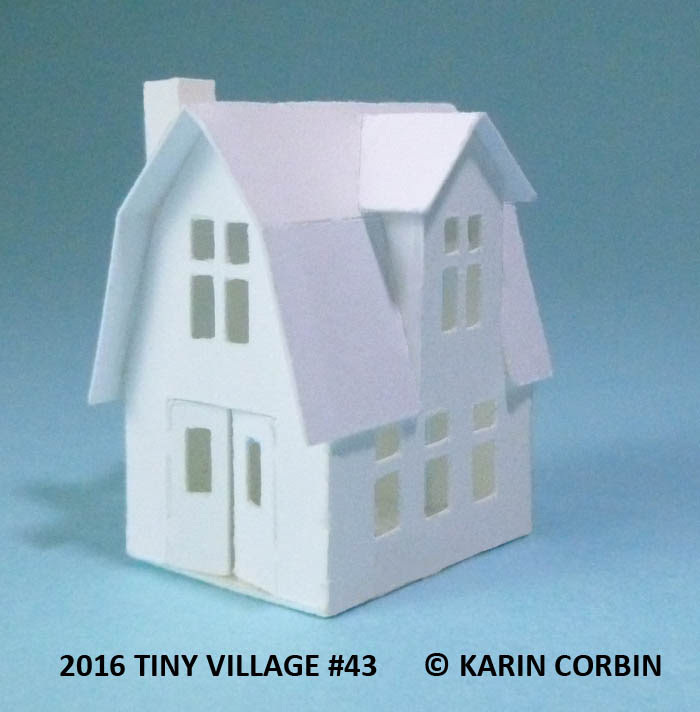 A little shop for your village. Your packet should contain the parts shown in this photo. 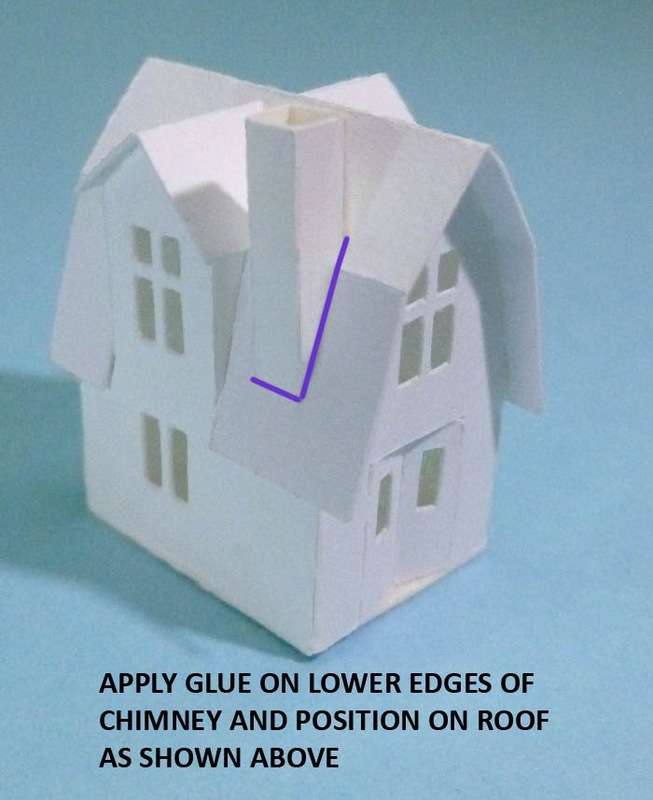 Assemble the chimney and the ridge line of the front gable roof. Now glue the walls onto the base section. Now for the last step place the chimney in the position shown. When looking at it from the narrow side of the building the back wall of the building and the back wall of the chimney line up. Congratulations you have completed building #42! 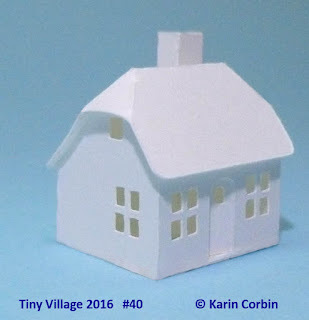 Perhaps a fire station for your Tiny Village 2016? The real life building that inspired this one is on a winding street medieval street in Sweden and is now being used as a cafe where you can stop for a cup of coffee. 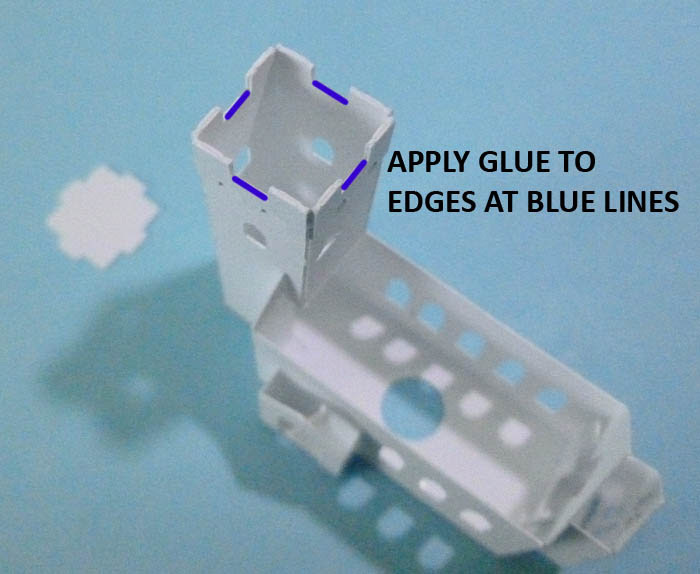 Your packet should contain the parts shown in this photo. There are two dormers on this building and the roofs are identical in size. 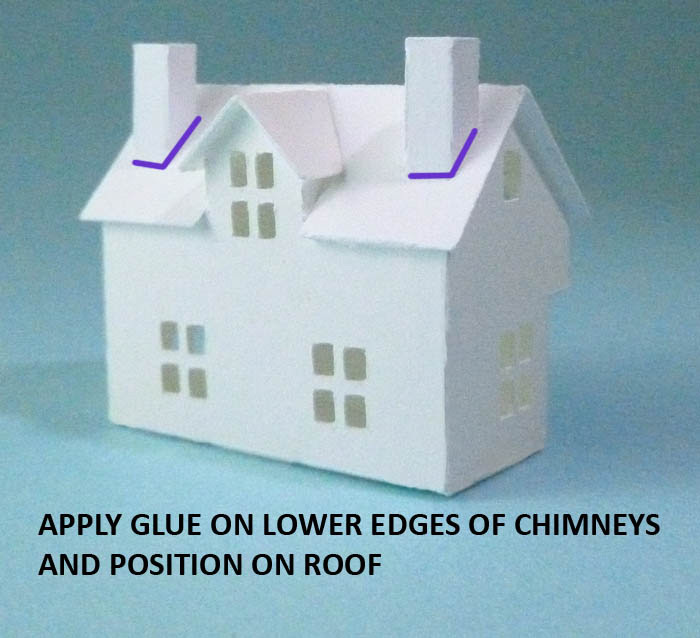 Apply glue to the chimney and set it aside to dry. 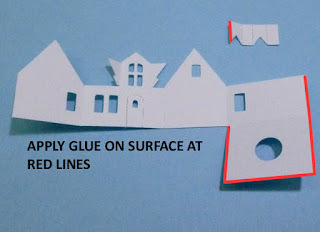 Apply glue to the upper surface of the base and fold the walls around to sit on it. 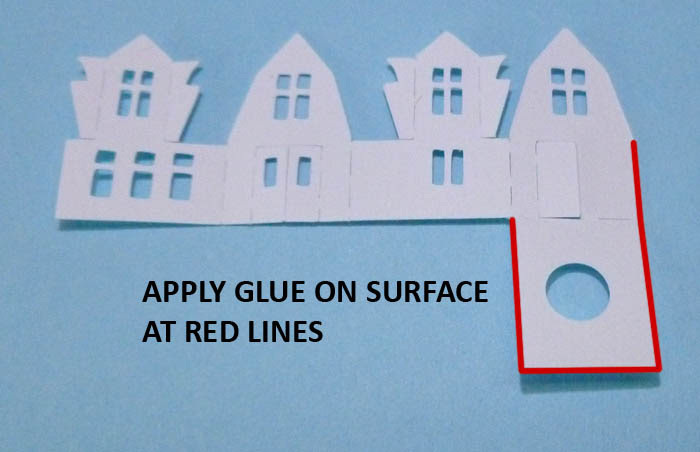 Be sure to position your door as you wish it to be or else leave a gap in the glue where it is located so it can be moved at a later time. You can do a check fit of the roof before you apply any glue. 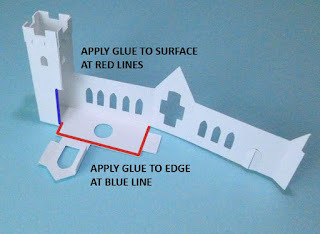 That will help you understand the movements needed to fit it into place before you get involved with glue. The dormer roofs go on now. 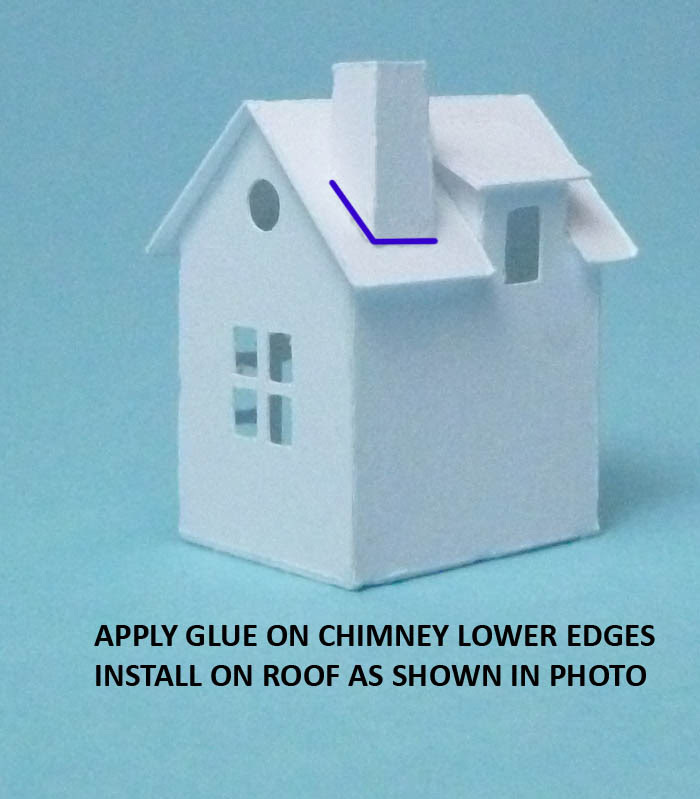 The lower edge of the chimney has two angles on it. 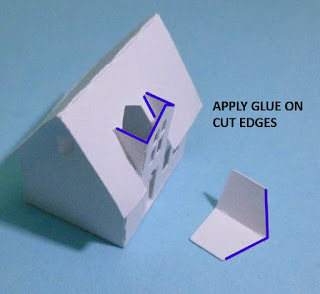 That is to allow it to sit against the change in angle on the roof. So before you apply the glue test it against the roof so you know exactly how to position it. 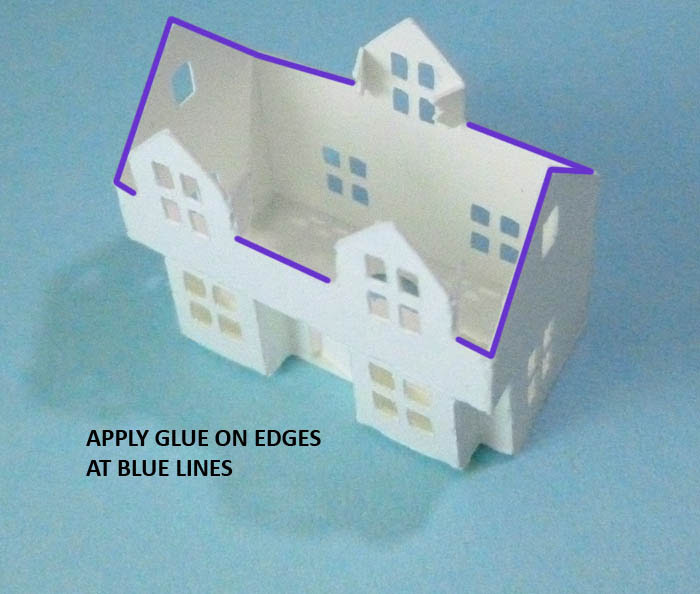 It installs close to but not directly against the dormer roof edge. 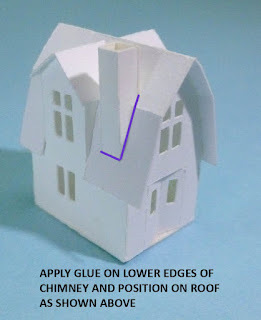 Now that you know where to put it go ahead and apply glue to the lower edge of the chimney. Look at it from several directions to make sure it stands vertical. 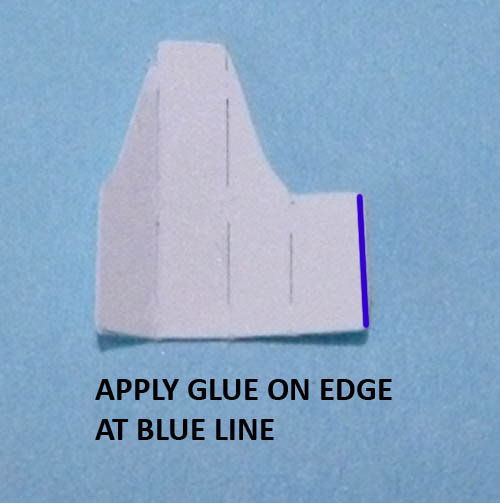 Then hold for a few seconds until the glue grips. Congratulations, you have finished building #43! Cottage with a sun room at one end. Your packet should contain the pieces shown in this photo. The dormer roofs are identical to each other. NOTE: on the micro sized version of this kit there are no side walls on the dormers. 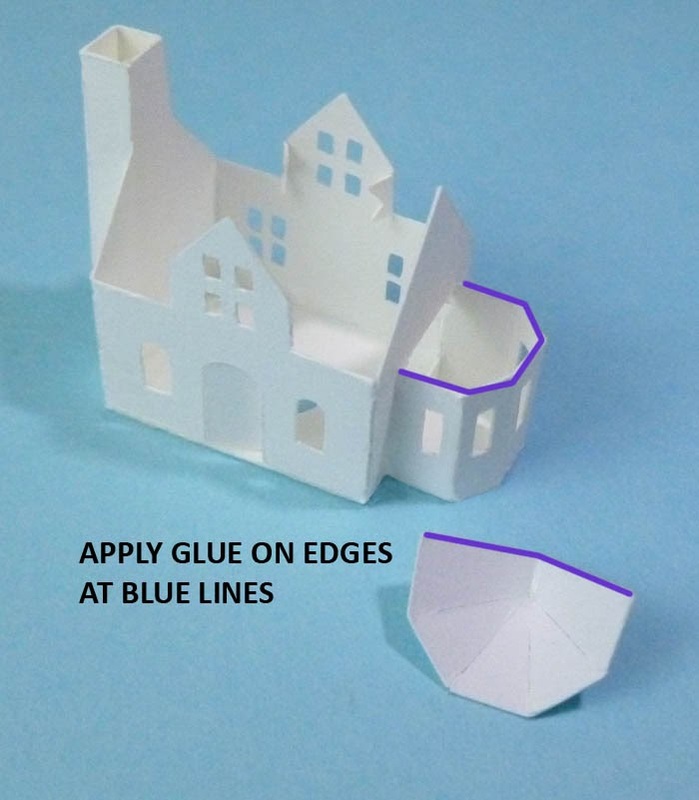 Fold the walls around and let dry. Now the chimney sides are folded in and up up against the side of the building. Be sure to press the chimney down firmly onto its base with no gaps under the chimney sides. The sun room is now folded around onto the base of that section. 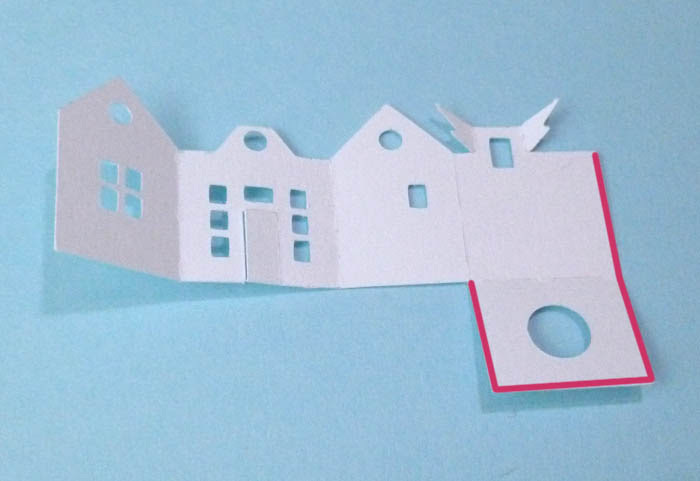 There is a tab on each side that will go into the interior of the building. 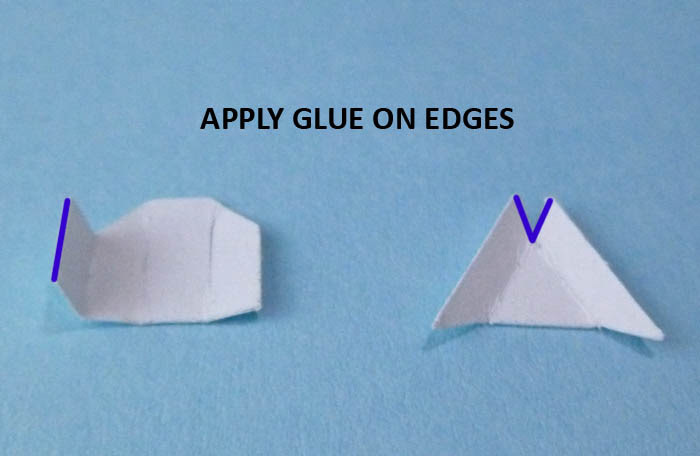 You can secure them with a small amount of glue on the underside of the tab. The goal is to not have any gap showing along the edge where the tab goes through. The sun room roof goes on now. At the upper edge of the roof there is an extended area that will pass through the triangular shape on the wall. That triangle holds the ridge of the roof at the correct height. 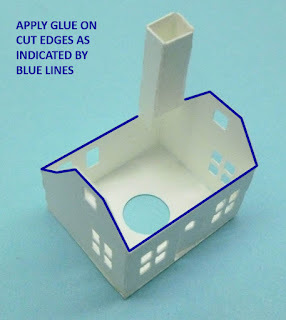 I find it helps for an easier time of inserting the extended area into that hole to tilt the roof upwards at an angle then push it on into the hole and lower it in position onto the room making sure it fit tight against the sidewall of the main building. The main roof goes on now. 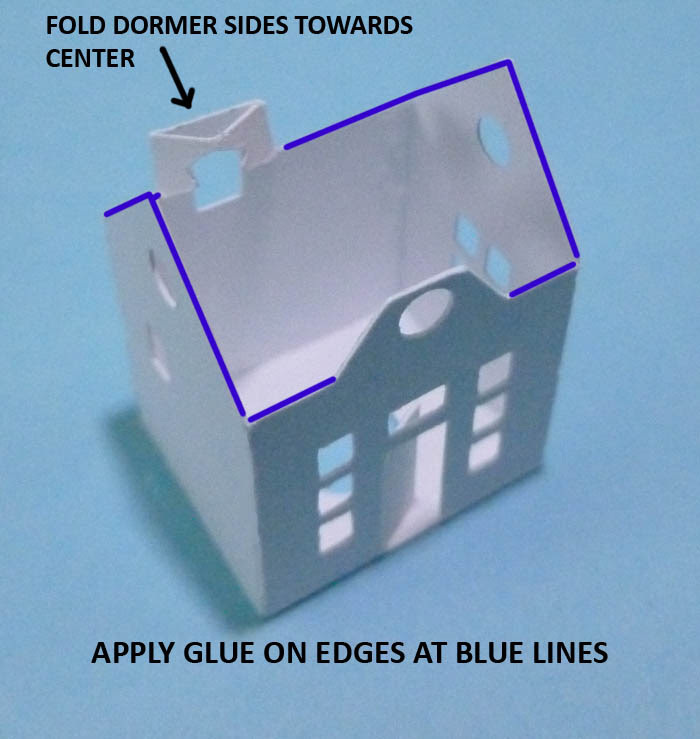 Be sure to fold in the sides of the dormers. 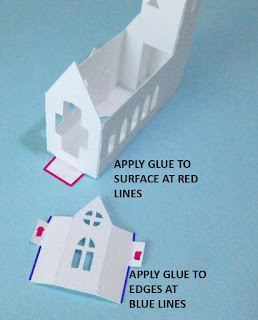 Note: The micro size version has no sides on the dormers as they became too small to fold. 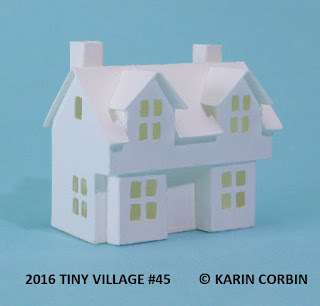 Note: The micro size version has no side walls on the dormers. Congratulations, you have completed building #44! A tavern for the village. Every community needs a gathering place where people come to relax, have food, share a casual meal and enjoy some entertainment. 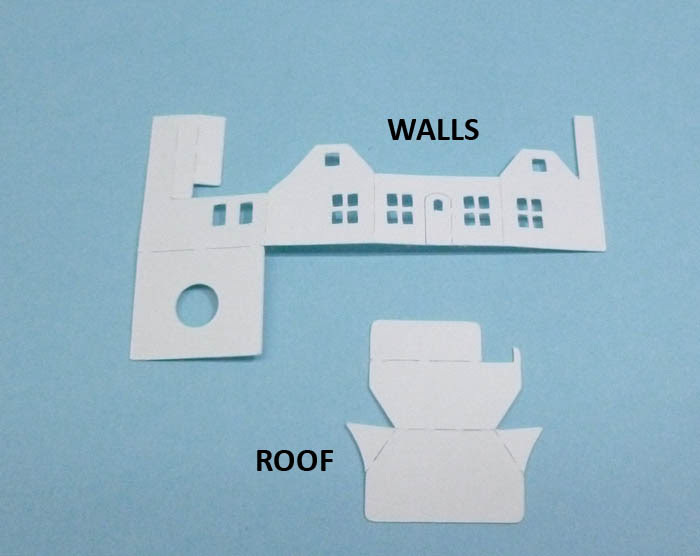 The packet for building #45 should contain the parts shown in this photo. 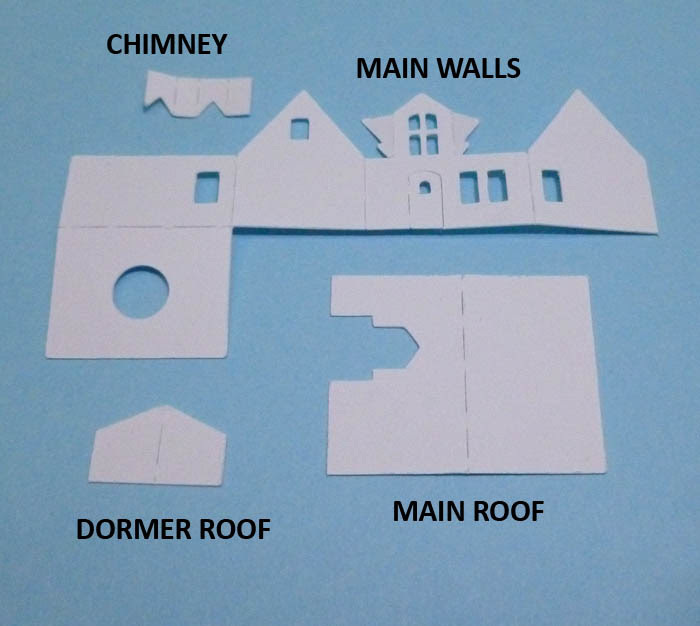 There are two identical chimneys and three identical dormer roofs. The assembly on this building is different than the previous ones. The lower front wall and right side wall folds in from the right side and the lower left wall and upper front wall fold in from the left side. There are a number of steps to assembling this building. 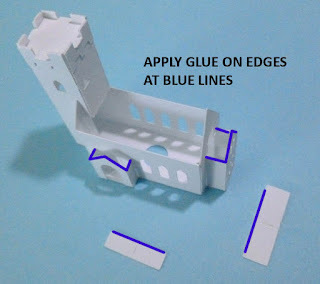 I suggest you first look through all the steps and also do a dry fit test to see how it goes together before you start using glue. Keep the upper front wall extended out of the way over to the left side. Fold the two front bay windows up and secure them to the lower front wall. 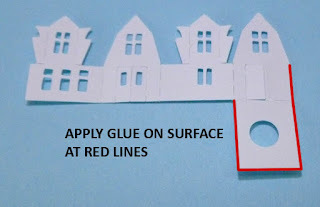 It is critical than when folding up the bay windows that the be seated firmly onto the base with no gaps between the base and the side walls of the bay. So give it them a very gentle downward push until the glue grips firmly. Bend up the section at the bottom of the upper front wall. 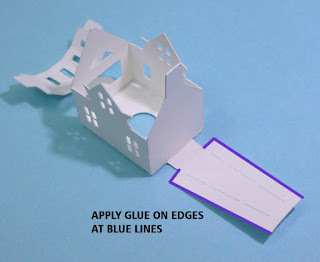 Bend down the tab that is just over the door, that tab will help guide the bay window roof cover section into place and act as a stop to keep it in the right position. Now fold the upper front wall around into position over the bays. Turn the building upside down and look to see that the spacing of the upper wall is even across the width of the overhang over the bay windows and that the wall section that creates the roof over the bays is adhered firmly in place. The main roof goes on now. 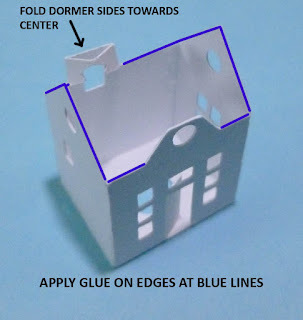 Remember that you may have to flex outwards on the dormer walls and also tuck in those dormer sides to get the roof firmly seated in position against the top of the walls. Be sure to turn the building upside down and also to look at it from the sides to see if the roof if firmly seated onto the top of the walls. The chimneys go in place now. When looked at from the narrow side of the building the front wall of the chimney and the upper floor window are almost in line with each other with the chimney sitting slightly back from the edge of that window. The side wall of the building and the chimney are in line with each other. Congratulations, you have completed building #45. I have been asked to create more churches for the Tiny Village series so I have included one in this set. It is a small chapel sized church. 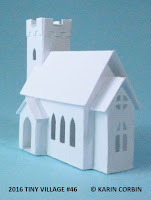 It has a bell tower and a chancel area for the alter plus an entry porch. The motif of a cross is incorporated into the chancel windows. If you want the look of stained glass before assembly to the inside of the walls glue in place pieces of transparent vellum paper or color some plastic material with a felt tip marker. 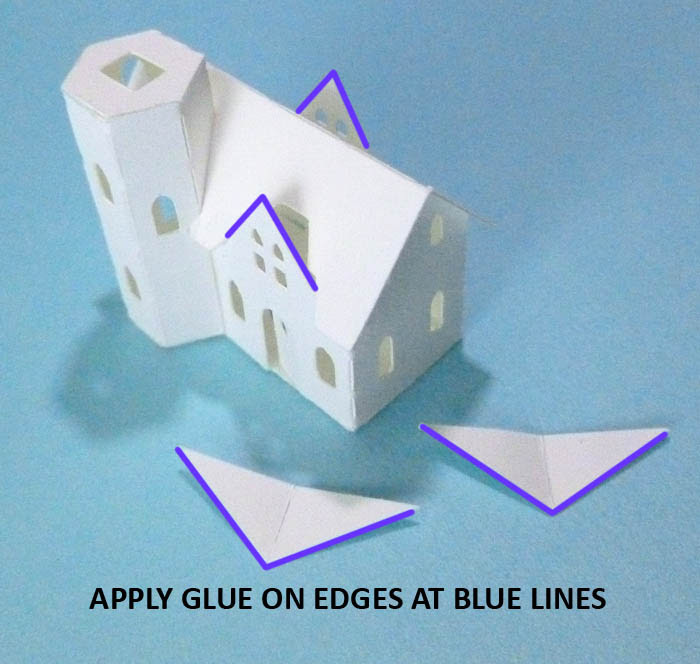 There are a number of steps in this building and you should let the glue dry between steps. 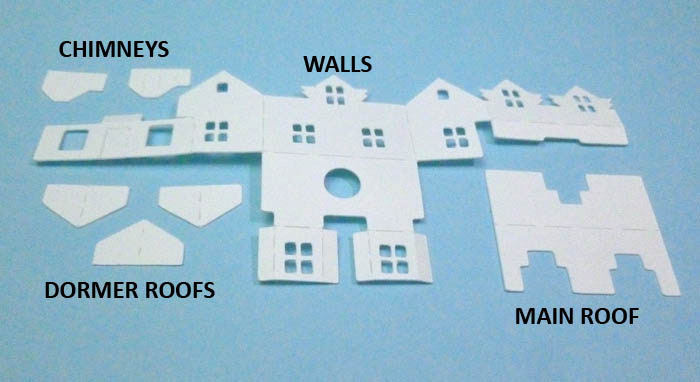 Your packet should contain the pieces shown in this photo. On this assembly you will want to use that long skewer or a toothpick to reach inside the building to nudge walls into proper alignment. 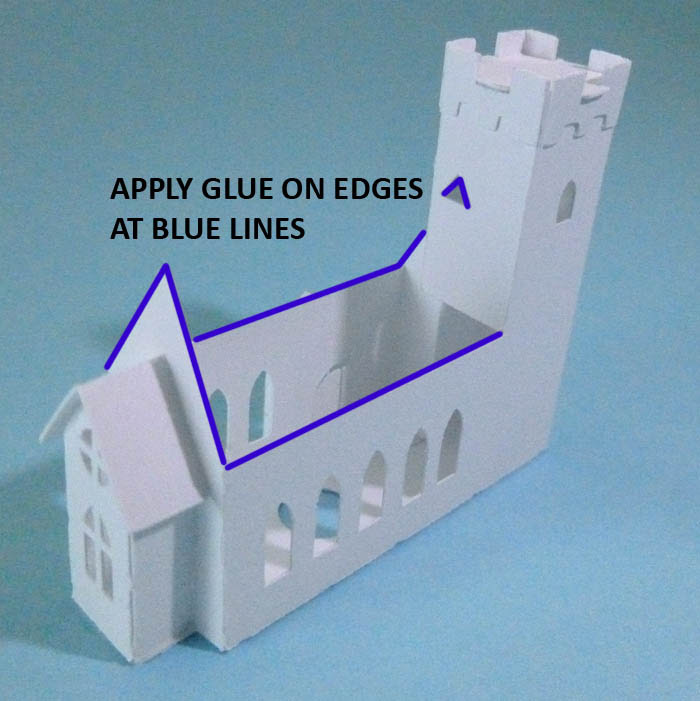 At the top of the tower walls there is a crenelation detail that gets folded down to the outside of the tower. You can see how it will look in the first photo in this set for building #46. 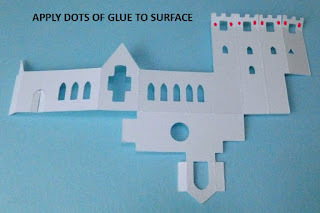 Small dots of glue are applied as shown. 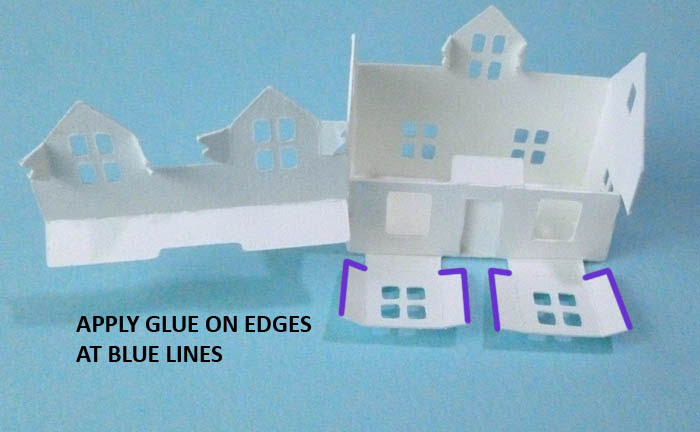 Just hold in place with fingers or tweezers until the glue grips. The tower section folds around first. 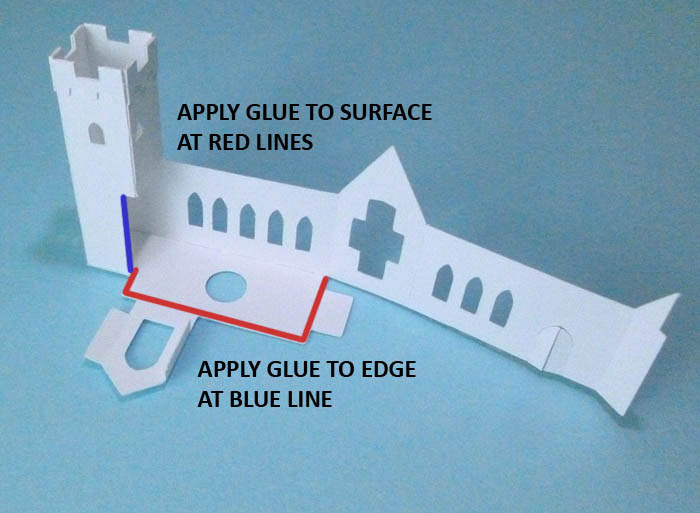 Be sure to let the glue dry before moving onto the next step and adding an extra fillet of glue inside the joint where the tower walls wrap to meet each other is a good idea. At the end of the left side of the front wall there is a small section that folds back to the left into a notch in the tower wall. You do need to put glue on the edge of the vertical tower wall to secure it in place. That narrow wall section was left overly long for covering any potential small light gap. The entry porch is folded up into position now. Be sure the side walls sit firmly onto the base. 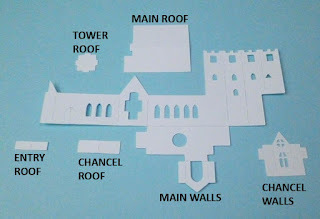 Install the chancel walls now. The tabs will fit against the sides of the area notched out for them and there should be no visible gap along those edges when looking at it from the exterior. Using tweezers to hold onto the tower roof lower it into position in the crenelations. The two small lower roofs get put in place now. The larger of the two goes onto the chancel area and the smaller is the entry porch roof. 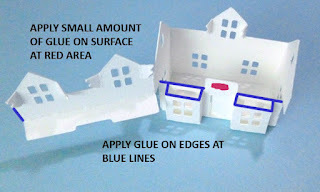 Before you put any glue onto the walls for securing the roof I want you to do a dry fit test run so you know how you have to move your hands to make the roof installation easy. There is a small triangular opening in the tower wall and there is a small area of projection on the end of the roof that will fit into the triangular opening. 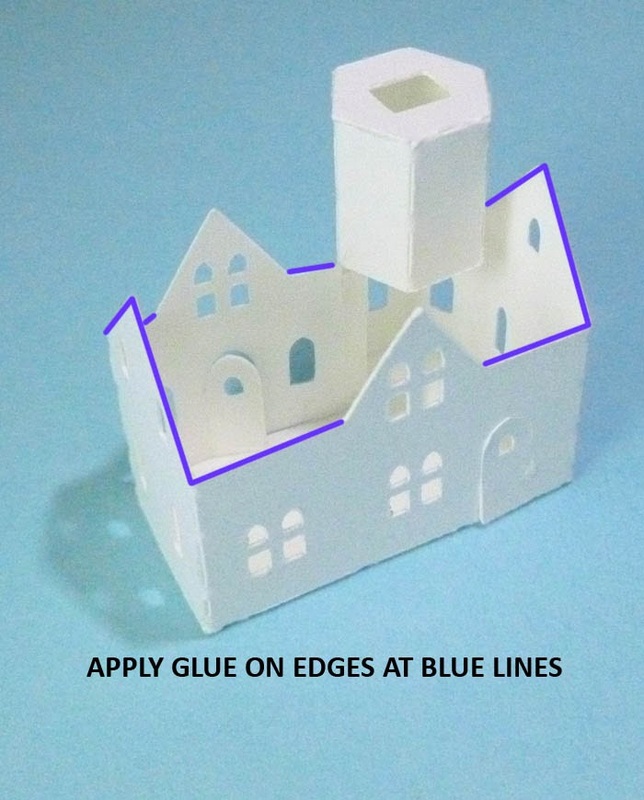 That triangle helps support the end of the roof at the correct height against the tower. Tipping the roof at an angle makes it easier to insert that notched end of the roof into the triangular hole. 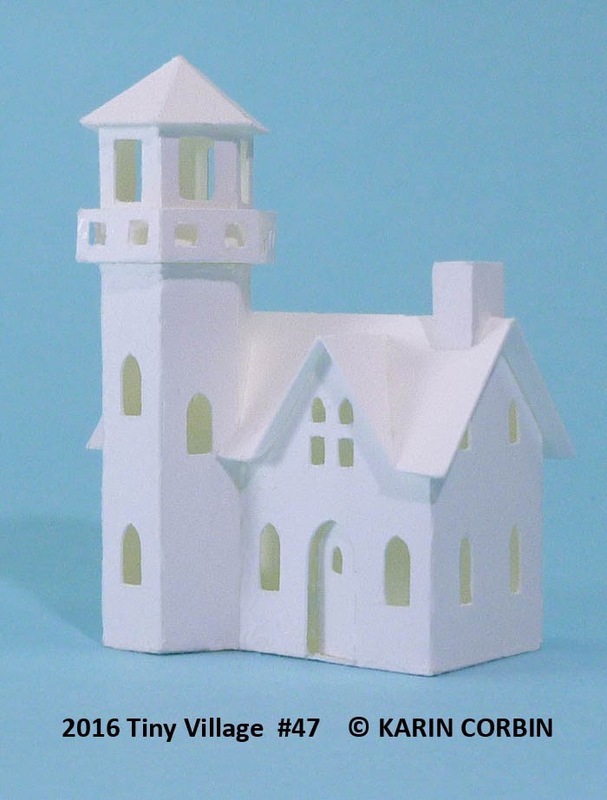 A coastal cottage lighthouse for the village. On the seaside or on a big lake, lighthouses are always fun to visit on a holiday. I gave this one a Victorian Gothic revival era influence. First we complete the four small sub assemblies as shown in this photo and set them aside to dry while you work on the main section of the building. Working on them one at a time and apply glue as shown in this photo. 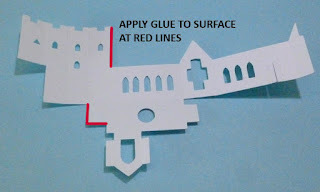 After the glue dries you can apply an additional glue fillet to reinforce the joins if needed. The upper part of tower area folds around first and its top is folded down onto the walls. 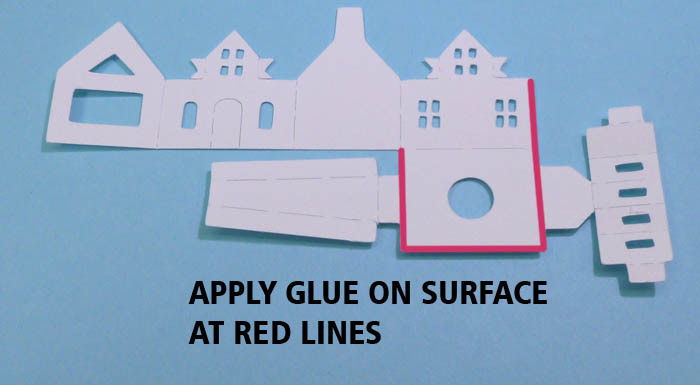 It is important to let the glue dry before moving onto the next step. 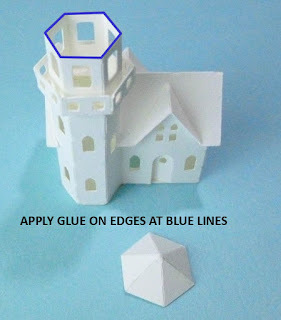 Now the tower folds around and is glued to the base of the building, be sure the walls align flush to the outside edges of the base using the long skewer or toothpick to nudge them into position if needed. Let dry before moving onto the next step. The walls coming from the left side wrap around and get adhered onto the base and against the tower wall. There is a long tab at the end of the front wall. Bend it forward towards the front of the tower. 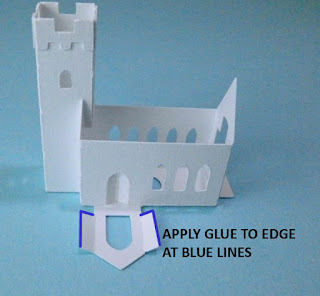 It helps provide a little extra glue surface for the tower wall to rest against inside of that folded corner. 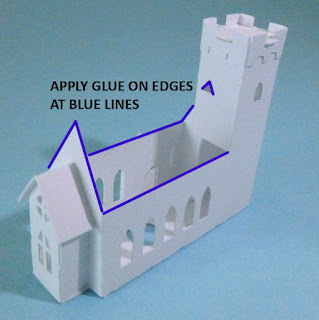 The tab itself doe not need to be fully folded back and glued to the tower wall, it is just the inside of that corner that is doing the job of adding a little extra support and gap covering. The main roof goes on now. 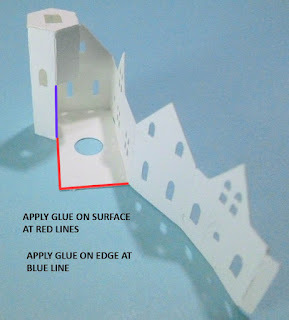 Do a dry fit check first so you have confidence of making the right moves to put it into the proper position when you have glue applied. I give the roof a gentle little wiggle as it goes around the tower which seems to be enough to allow it to pass around that shape. 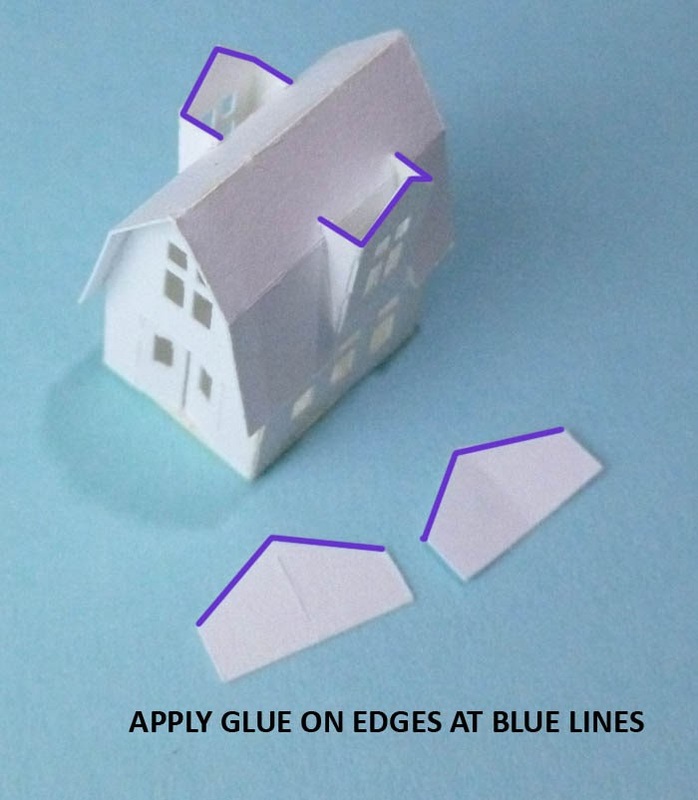 Be sure you turn the building upside down and sideways to check the fit of the roof so it well seated against the top of the walls with the gable tips nicely upright and evenly spaced from the roof edges. 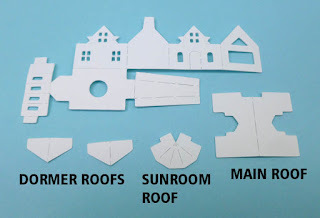 The front and back dormer roofs are identical in size. 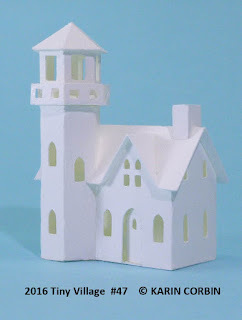 There are rectangular holes in the tower top, the railing section and in the base of the lantern room. 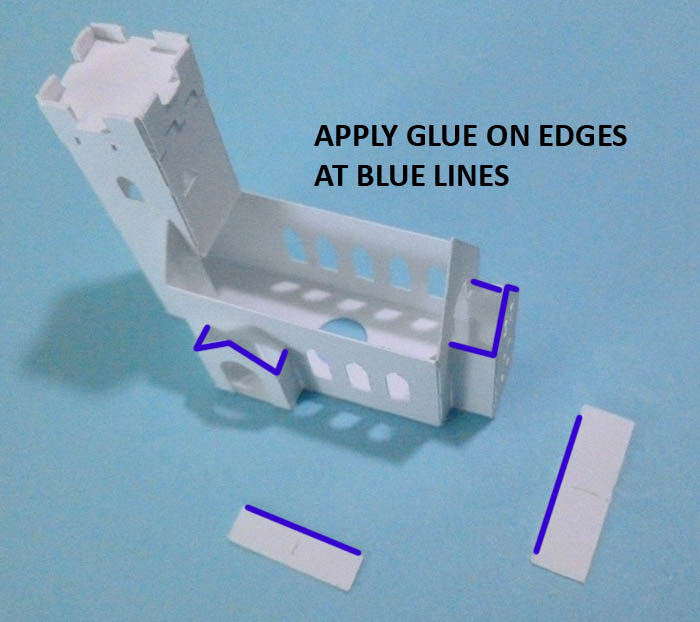 These pieces of the tower stack on top of each other and you can use the flat side edge of your craft knife or the sides of your toothpick inside of the rectangles to push the tower sections exactly in line with each other. I stack the railing onto the main tower section, and then place the lantern on top of the railing. 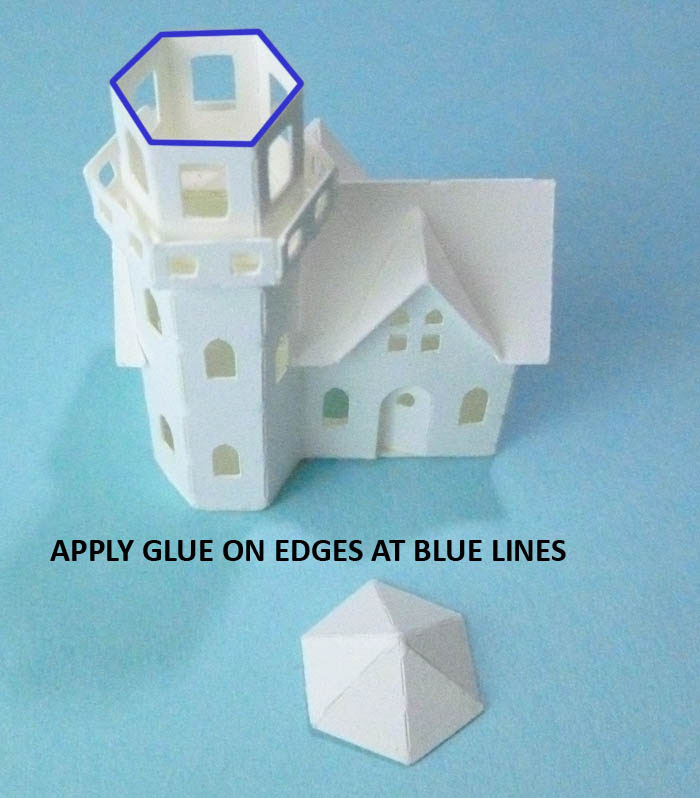 Use a little gentle downward pressure until the glue grips before adding the next tower section on top of the last one. The roof of the tower goes on now. 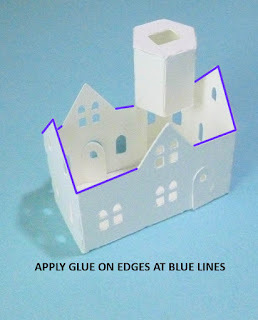 You need to work quickly before the glue sets to be sure it is sitting nicely level on the building. First I look from underneath the building to see that the overhang of the roof is even on all sides then I look at it from the sides to be sure it is sitting level. 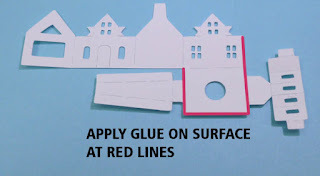 Last step for assembling your village, glue the chimney into the position shown in this photo. Hurray, all done! 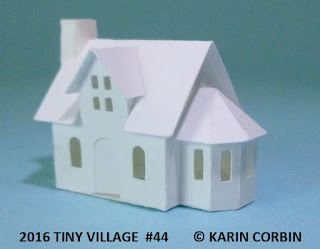 I hope you had a lot of fun and that you come back next year for another new village set.